A 4 star hotel with a vast range of facilities set in a peaceful setting making this a great resort for guests looking for a stress free holiday. All 402 air conditioned rooms include ensuite bathroom, satellite TV, telephone, hairdryer and safety deposit box (for hire). Facilities include 24 hour reception with foyer, lifts, safe, currency exchange desk, snack bar, pool bar, lounge room, restaurant, nightclub, internet access, laundry service, kids club, kids playground, 2 swimming pools, sun terrace with sunbeds. Other facilities include various themed evenings, tennis, squash, table tennis, sauna, Lido opposite hotel, darts, rifle shooting, massage, diving centre and daytime organised activities include keep fit and water polo. Free Child Places Taurito Princess Hotel, Playa Taurito, Gran Canaria. 4 star. 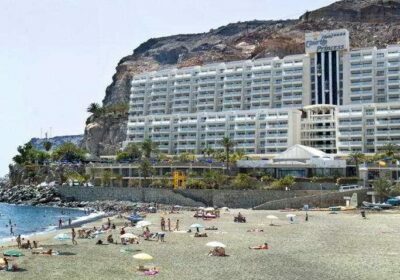 Book Online Now for Taurito Princess Hotel, Playa Taurito, Gran Canaria Package Holidays with Top Tour Operator to claim your Free Child Place. Sea views from the rooms and the pools make this hotel a laid-back retreat. All rooms at this beachfront hotel get a sea view, and the place is just steps away from the black sand. A free shuttle bus gets you to Puerto Mogan in five minutes, or there are cabs outside which will take you to Puerto Rico, about 10 minutes away. The hotel has two dining areas, including one with al fresco seating. There’s also a funky piano bar and a sports bar. All this, plus a couple of good-sized pools as well. Archery is for over 18s and the mini-disco is at Salon Princess.